The „Barcsay Art Brute Circle” works with the help of the Awakenings Foundation in Hungary. 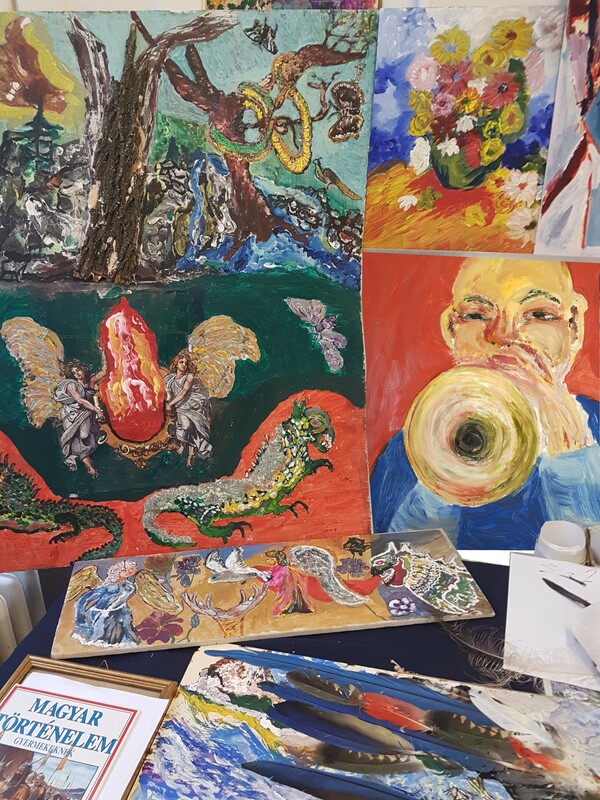 It is not an art-therapy group in the traditional sense but an open creative art Circle, where healthy people and people dealing with different mental health problems can meet freely, inspire each other and create artistic works. Our community does not consist of patients, clients, amateurs or professionals, but people, who feel the need to Create. Anyone who accepts the principles of the Circle can join. Our artists are free to own their creations, and decide collectively which works should be exhibited. In the case of (unfortunately rare) sales, they support the work of the Circle and the Foundation with a 20%. They create their own works in a broad spectrum of styles and talents, with the help of a professional art director Andrea Bartha. We did have collective exhibitions, and some of our members have already had their own individual exhibitions. The artistic director Andrea has developed a special multi-step program, which is constantly evolving, enriched by the experience of the Circle’s members. The program is not compulsory, yet it helps to master the creative process easier and in an entertaining way. With personal assistance of the artistic director, each participant is able to proceed at its own pace. Likewise, everyone can choose to do different things, despite taking part in the program or not. We believe that the group already has some great artists! (Pictures of their work are available below). We have many plans for the future, we want to further develop the Circle, acquire a larger work-place and complement it with other artistic alternatives (movement, music, theater), as well as to organize a festival. The Circle would also like to meet and exchange experiences with similar groups in other countries. To enter an international exchange program is one of our dreams. Unfortunately the Circle has no funds at all (except some rather small, irregular individual donations). For the moment, our art director is working as a volunteer, though we would really like to continue working on this new art-therapy system with her. More information and pictures from the latest exhibition can be accessed here. You can also watch a short video with some first-hand description about the studio.